The Federal Assembly is the national legislature of Anaaxes established by the Constitution of Anaaxes. It consists of the popularly-elected Federal Senate, which handles most legislative affairs, and the Federation Council, which primarily handles constitutional affairs and matters affecting the federal union or provincial competencies. The Federal Senate consists of 500 Senators in total, 400 of which represent a single-member district of about 200,000 people, and are elected by instant-runoff voting to a term of four years, staggered so that half of the single-member district Senator seats (200) are up for election every two years. The remaining 100 Senators are elected nationally via closed party-list proportional representation to two-year terms. No person can be elected a Senator more than four times consecutively. Senators are elected by citizens that are at least 17 years of age on election day. A Federal Senator must be a citizen of Anaaxes of at least 18 years of age on or before election day. Senators representing single-member districts must be residents of their constituency and cannot be re-elected once they attain 72 years of age. Senators receive a daily salary equivalent to the current federal minimum wage, telecommunications devices, business class airline travel vouchers depending on their distance from the Capital, free personal meals at the Capitol cafeteria, home alarm monitoring service, a bulletproof vehicle for personal and official use while in office, and a Capital housing stipend depending on financial need. They also receive a Capital and constituency office, a small salaried staff for constituent services, stationery, office equipment, and mail franking privileges for nonpartisan use. Senators have parliamentary immunity for all statements made on the floor of the chamber or in a committee hearing and cannot be punished for it except by the Senate itself, to preserve decorum. Senators are also privileged from arrest, search, and civil processes while inside the Capitol and in going to and leaving from sessions of the Senate, except as waived by the Senate or its officers pursuant to law. 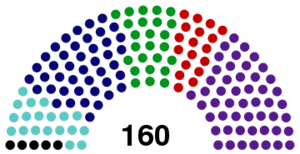 Jointly, with the Senate, enact a federal law regarding: the uniform date for federal elections; the granting or revocation of national citizenship; the composition or jurisdiction of the inferior federal courts; the creation or expansion of a capital offence; the location of the permanent seat of government; and the regulation of the security of or access to the meeting places of the Federal Assembly. The President derives their power from either two sources: powers vested in the presidency itself and powers vested in the Apostolic See of Serenno. Any President elected by a national popular vote is entitled to execute both types of powers freely. However, an un-elected acting president cannot execute apostolic powers without the countersignature of an Apostolic Commissioner. The Federal Constitutional Court consists of 12 Regents, which elect a Presiding Regent from among themselves every two years, who acts as the administrative head of the Court and who also presides over its sessions and conferences. Regents serve staggered terms of various lengths, depending on their selecting authority. If a vacancy occurs intra-term for a Regent seat, the original selecting authority will fill the vacancy with a new Regent who will serve for the remainder of the term. In the case of intra-term vacancies in presidentially-appointed Regent seats, the President which originally filled the seat retains the right to appoint a replacement if are still alive, mentally competent, and if they were not impeached and removed from office as President. This page was last edited on 25 April 2019, at 21:30. Content is available under Creative Commons Zero 1.0 Universal license unless otherwise noted.